The Languedoc region of France is known for its moderate temperatures and stunning natural environment. These features can be enjoyed alongside state-of-the-art camping thanks to the venue of Le Mas de Lavandes. LUX-Camp is pleased to address any additional questions and provide further information on this stunning site. What Features make this Holiday Camping Site so Attractive? A large outdoor aquatic water park. Activities such as tennis, diving, angling, sailing and surfing. 150 individual and private pitches. A spacious and luxurious restaurant overlooks the water park found within Le Mas de Lavandes. Both regional and international foods can be found here while there is a particular emphasis placed upon Mediterranean cuisine. Anyone who wishes to quench their thirst before a meal or while absorbing the tropical sun can order up a drink from the bar found within this restaurant. Other shopping facilities include a grocery store, a bakery and a snack food outlet. 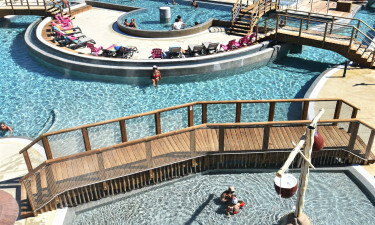 No expense has been spared in terms of camping luxury thanks to a large water park of no less than 2,300 square metres. This attraction is suited for children and adults alike; perfect for anyone who wishes to remain closer to their mobile home. Still, the azure blue waters of the Mediterranean Sea are found less than two kilometres from Le Mas de Lavandes. Please note: The pool area is open from the 1st of April to the 30th of September. The coastline here is calm and the sands are spectacular. 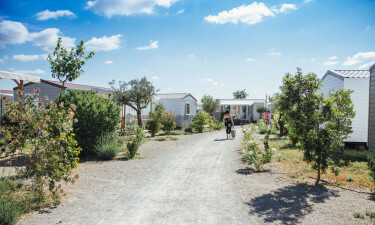 Some modern facilities found within this holiday camping site include food provision outlets, baby changing areas, two private washing cubicles and designated waste disposal sites.